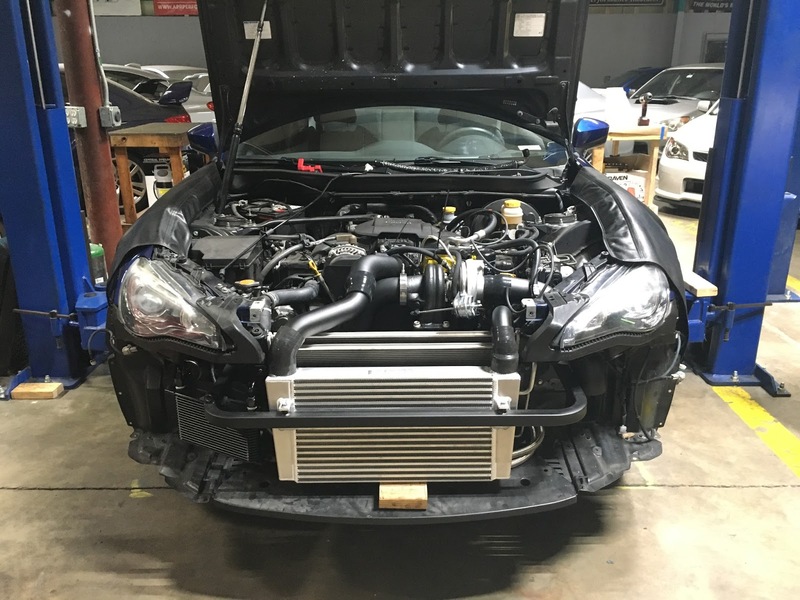 This BRZ came to us bone stock, and the owner had some idea on what he wanted, but wasn’t exactly sure how to go about it. 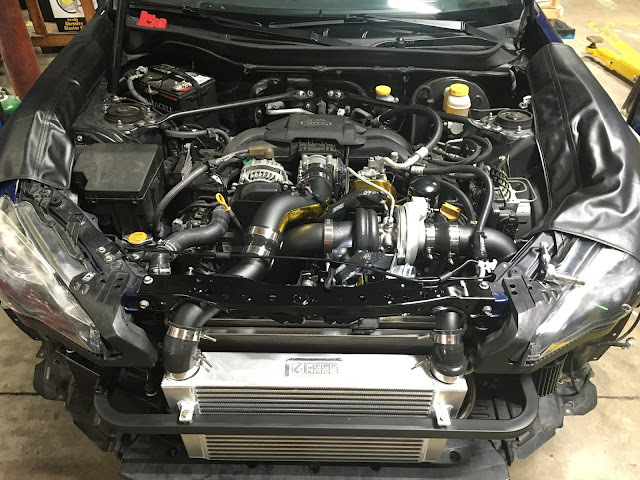 His goal was to install a turbo kit into his BRZ and have it tuned so we could raise the horsepower and torque levels to something a bit more enjoyable that the factory 200hp rating. We sat down with the owner and went over our suggestions for the appropriate turbo and kit for his goals and budget. He wanted to “do it right” and not go the cheap route on the kit or parts. With that in mind we suggested a Full-Race turbo kit paired with an BW EFR turbo. The two options were for the 6258 or the venerable 7163. He opted for the larger 7163 so that he would have some headroom later to raise power levels, plus he liked the fact that the turbo is used in Indy racing! We set about putting together a parts list and plan for the build. One of the first parts we needed to address was the factory clutch. The BRZ / FR-S / GT86 comes with a very light clutch from the factory, and it is not up to the task of handling turbo power levels. 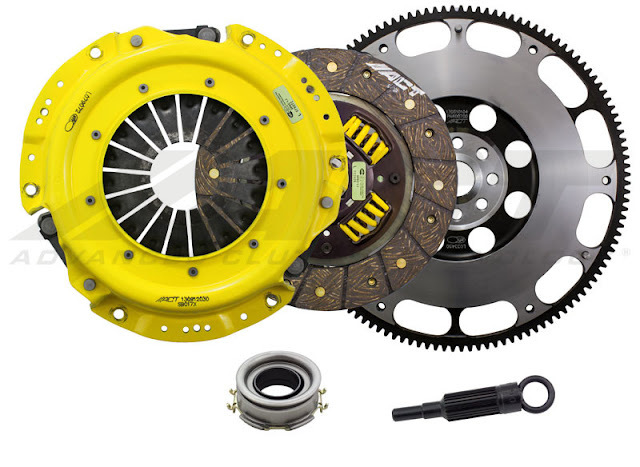 So we ordered an upgraded ACT clutch and flywheel kit that would handle the extra power. This was installed first, the owner was instructed to drive the vehicle and get some miles on the clutch to break it in. This is often an overlooked aspect to a build, as in the event that we installed the clutch along with all of the other turbo kit components, there would not be any time to break the clutch in before dyno tuning the car. 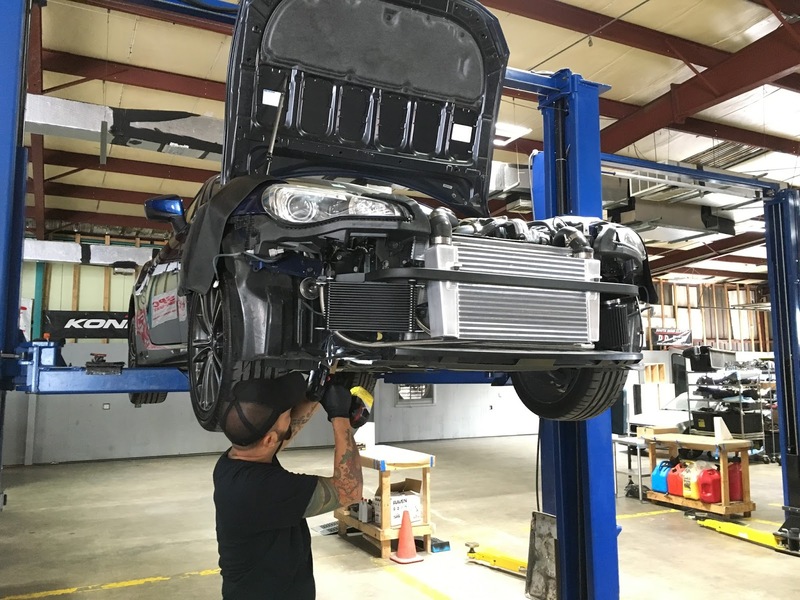 It is always ideal to get a clutch installed ahead of heavy power mods, to break it in and have it ready for dyno tuning once the power mods are installed. We also addressed the brakes, installing a new set of pads, rotors, and stainless steel brake lines. Another often-overlooked area on a car build, the brakes are very important. When adding a significant amount of power you must also add the extra ability to slow that power down, or you may regret it at the worst time! Once the car was back in the owners hands and accruing break-in miles, we ordered the rest of the parts necessary for the build and we all patiently waited for the BRZ to return! Once the owner brought the car back in we were ready to dive in and get the build started. We had a Full-Race turbo kit, complete with black ceramic coated exhaust piping, a FMIC with piping, and all the necessary hoses, clamps, etc. At our recommendation an oil cooler was also added to the list. The oil temps that can be seen even on a stock car driven hard are very high, and with the added heat from a turbocharger, those temps can get dangerously high. The FR oil cooler will add some much needed cooling to the oil system, as well as some extra oil capacity. The upgrade pile also included a new DW high flow fuel pump, MAP sensor, AFR/Boost gauge, and some other goodies. We added some extra heat retention items as well to try and battle the high underhood temps these cars can see, more on that shortly. The first step was to get the front bumper and under-panels off the car. We would need access to the entire front end of the car including the bumper beam for this install. 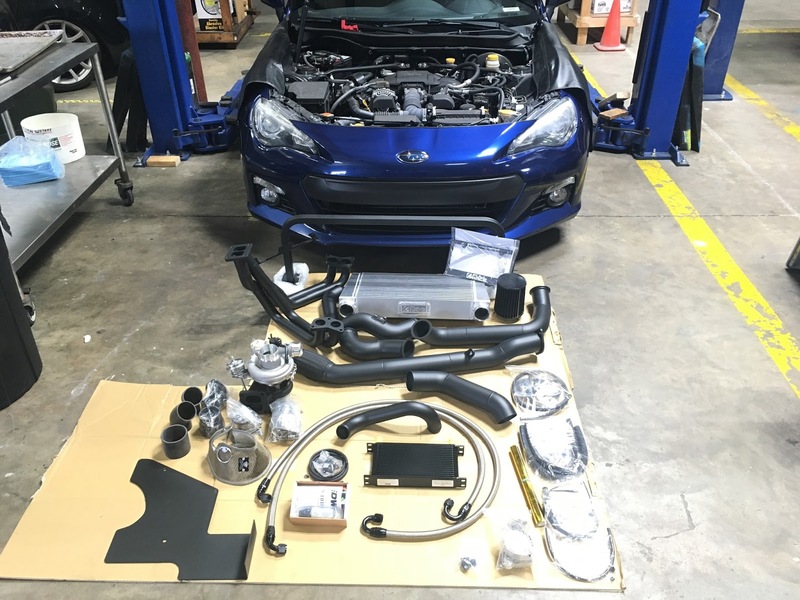 The OEM beam is removed discarded, with a replacement beam provided by the Full-Race EFR turbo kit for the BRZ / FR-S / GT86. This beam is smaller than the OEM beam and has provisions for both the front mount intercooler and the oil cooler. The upper rad support is also removed and trimmed to clear the FMIC pipes. Once we trimmed the rad support to clear the pipes we then painted it black, to prevent any rust or corrosion and to give it a more finished look (it’s the small details sometimes!). The next step was to drain the engine oil and remove the factory oil pan, as the kit requires an oil drain fitting to be welded in place. The pan is then thoroughly cleaned and prepped for fab/welding. Our fabricator drilled a hole for the AN fitting just the right size, and then welded the fitting in place. We welded it with a bit of “shallow” entry to the pan, to promote as much oil drain back into the pan a possible with no restrictions. This is important as oil needs to not only flow into the turbo as freely as possible, but also back out of the turbo so it doesn’t create a back up. The pan is then final cleaned and painted, ready to install! Next up on our list was to get the turbo manifold, turbo, and exhaust piping installed. The exhaust manifold from FR is a very nice piece and is ceramic coated to help retain heat in the piping. 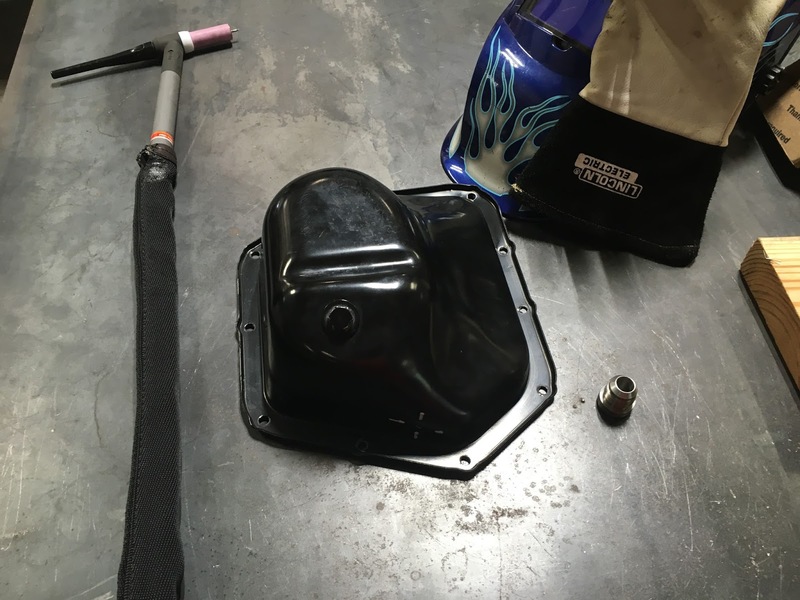 This has a two-fold benefit, as the hotter the exhaust gasses are the faster they will move through the piping, and thus through the turbo, helping spool. The other benefit is that the radiant heat is kept down, which in turn keeps the under-hood temps down, which is always an issues with turbocharged cars. High under-hood temps will raise intake temps, cook engine bay components, and in some cases can actually melt/destroy them. 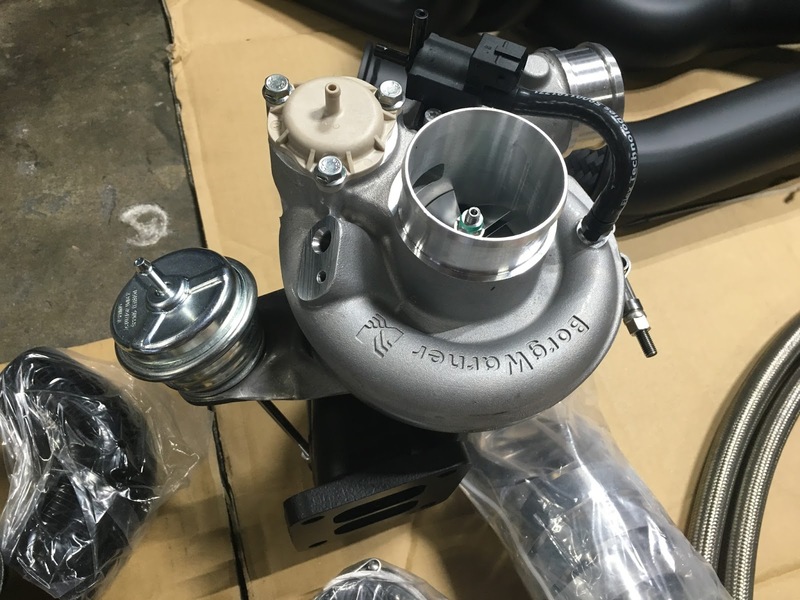 The manifold fit without any issues which is a benefit of a quality kit, and the Borg Warner EFR 7163 turbo was bolted in place. We attached the coated downpipe, overpipe, and front pipe and bolted it up to the factory catback exhaust (the owner wanted to retain the factory catback for cost and sound purposes). 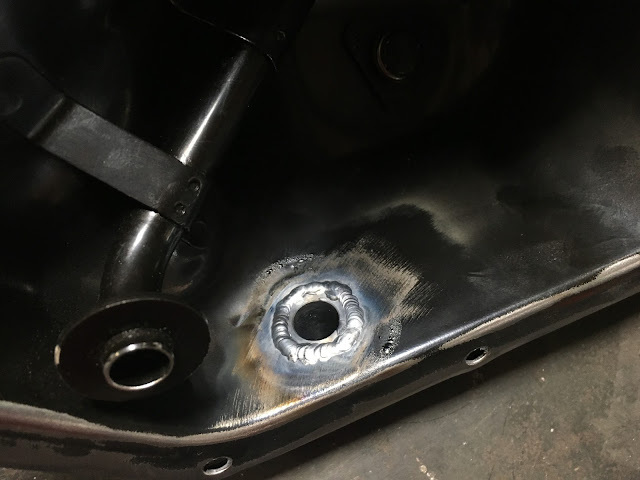 The oil pan was installed after cleaning off the mounting surface, and the oil drain line was fitted and installed. We made sure the oil drain line was not kinked and had a clean flowing radius down into the pan. Back to the front of the car the FMIC was mounted to the new support beam and the intercooler pipes were run accordingly. We had a few clearance issues, which we would address a bit later to ensure no issues. Next up was the oil cooler, which is mounted to the support beam, and then the stainless steel braided lines are run up to the oil sandwich plate. The direction has the lines running in front of the intercooler, but we opted to run them between the intercooler and radiator. There was plenty of space and this provided a cleaner look, and a little more air to the FMIC. The lines were secured, and all of the piping, couplers, and clamps were tightened down. We then removed the factory washer fluid reservoir, which is required to run the FR cold air intake. 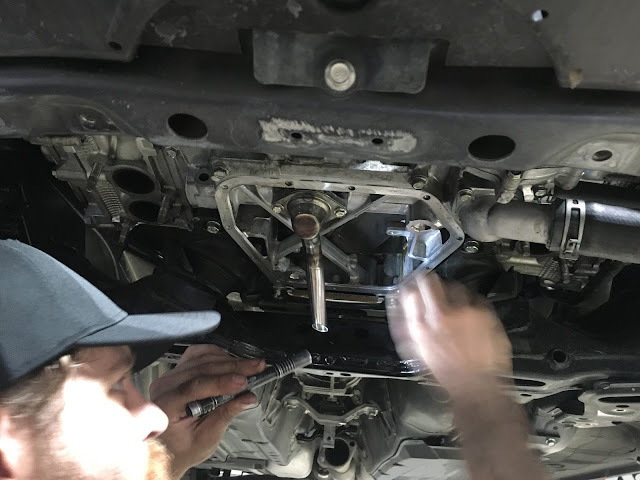 The owner was ok with losing his washer fluid to facilitate the longer intake, which runs into the driver side front fender well and picks up cooler air to feed the turbo. 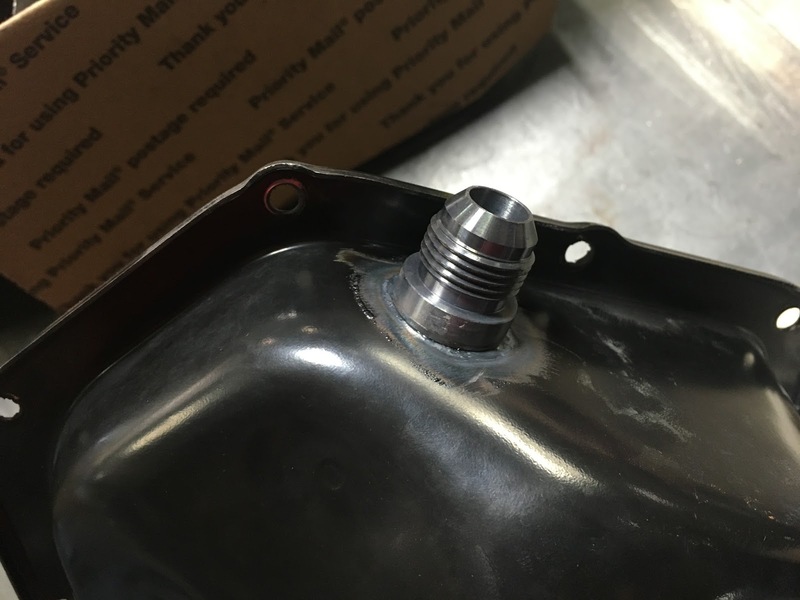 We notified the owner that a smaller washer fluid reservoir could be fabricated and mounted if he wanted, which he may do in the future. FR recommends a vented catch can on setups using a larger turbo, so we used an aluminum vented can and fabricated a nice mounting bracket that attaches to the passenger side strut tower bar. This allows the can to be solidly mounted, but also removable in case it needs to be thoroughly drained or cleaned. The bar and bracket were both painted to give a clean finished look. We ran the appropriate lines to vent both the crankcase and heads, replacing the factory PCV valve with a straight pass through fitting into the block. The benefit here is that the over-pressure in the crankcase is vented out of the catch can, instead of building up behind the pistons and seals, creating blow-by and oil consumption/burn off through the exhaust. The catch can will also “catch” oil particles as they pass through the can, which would otherwise be recirculated back into the engine. When oil is cycled back through the intake system/engine it builds up and can restrict air flow and lower the effective octane rating of your fuel, which are both bad! Next we moved into the interior of the car to get the gauges and boost control working, read on to part 2 for the completion of this build!